While digging through commits in the Chromium OS Repositories today, we stumbled across a very interesting new addition to an upcoming Chromebook. We’ll talk more about this device later as we are still gathering info on it, but for now we want to let you in on what we found as a result. 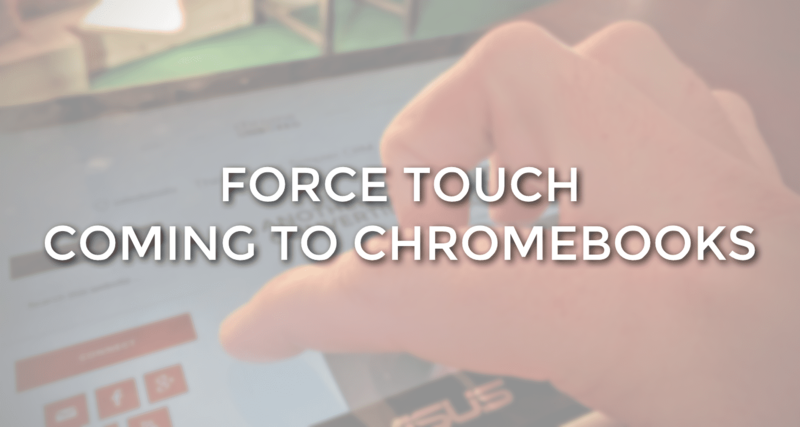 Pressure-sensitive touchscreens are coming to Chromebooks. We almost missed this today, but as we began looking into the commits for this new device, we saw a peculiar inclusion: 2 references to 2 different display panels on the main board file. This can mean that 2 panels are being tested and only one will remain, but that is usually met with a commit to remove one of the panels. Honestly, we aren’t sure yet, but this little fluctuation gave us reason to look at the second display. The first was an ELAN touchscreen. We’ve seen quite a few of those recently! The second display referenced was a device that is manufactured by Melfas, a Korean display maker. As we looked into Melfas’ portfolio a bit, we saw a few different screens they make, but nothing was a solid match to the generic numbers referenced in the commit. However, there was a model that supports pressure-sensitive touch along with standard, capacitive touch that got us a bit curious. So, we did what we always do. We searched. And we found some very interesting things, indeed. First up, we found this reference in the commits about adding FW (firmware) support for Melfas touchscreens. Nothing alluding to pressure-sensitivity, but it makes it very clear that support for these panels is being worked on. Next, we see where the actual script is being added to support Melfas displays. Again, it was clear that Melfas display support is coming along, but we still weren’t sure about anything beyond a new screen supplier. Finally, we found this: the Melfas MIP4 Touchscreen Drivers for Chrome OS. In this file, at line 444 we see reference to ‘Touch Only’ and on line 465 ‘Touch + Force(Pressure)’. Clearly this panel is set to be used not only as a standard capacitive touchscreen, but as a pressure-sensitive input device. But wait, there’s more! The Verge has this article showing that Android 7.0 will include support for pressure-sensitive displays. As we all know, the Android Framework in use in Chrome OS will soon be on 7.0 and will give developers the ability to leverage this new hardware capability on Android devices and Chromebooks alike. What are the ramifications of this? That part isn’t clear yet, but if Google and device OEMs are going to begin using pressure-sensitive screens as a new input method, it is fantastic to know that Chromebooks are already coming with this capability! It’s a win-win for developers to know that as they build amazing things for phones and tablets, Chromebooks will have all the tools necessary to keep up with them. As always, we’ll keep you up to date as we find out more, but this is yet another exciting turn of events for Chromebooks and Chrome OS!